The purpose of a quilting foot (usually called a walking foot) is to evenly feed all three layers of your quilt sandwich through your sewing machine during quilting. This presser foot is used by quilters for straight or gently curving stitching lines or for ditch quilting. 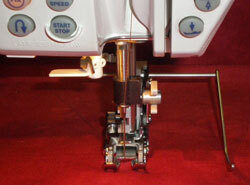 As you stitch with your regular presser foot, the feed dogs—found just underneath the presser foot in the bed of your machine—are chugging along, helping to move the fabric through the sewing machine. But what is that old presser foot doing? That pesky little thing is only moving across the top of the fabric. Depending on how much pressure is put on the presser foot (a manual adjustment on most machines) it is pushing the top layer fabric TOWARDS you— instead of through the sewing machine. ...and the result is a puckered mess. 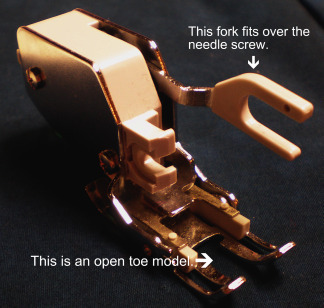 Every walking foot has a fork or extension or bar that rides on the needle clamp screw. As the needle bar moves up, the walking foot moves and feed dogs engage. A walking foot has its own feed dogs on the bottom. These work together with the sewing machine's feed dogs and help to pull the quilt sandwich layers evenly through the machine. When the needle is in the quilt sandwich, both sets of feed dogs are retracted from the quilt. As the needle comes up and leaves the quilt sandwich both sets of feed dogs move forward, then simultaneously grab the quilt sandwich and pull the layers together and through the machine until just before the needle pierces the fabric again. Just as the needle pierces the fabric, the feed dogs release it. It's simple. If the needle is in the fabric, the feed dogs are pulled back. Needle out of the fabric, the feed dogs are pulling the sandwich evenly through your sewing machine. Read your instructions that came with your walking or even feed foot. You may need to reduce the amount of pressure applied to the foot as part the installation. Most machines do not come with this presser foot. You'll have to buy it separately. Purchase an open toe version if at all possible. ”Stitch in the ditch“ quilting or following the marked lines of quilt designs is easier to when nothing is between your eyes and where the needle pierces the fabric. Have your machine manufacturer, make and model handy when you purchase your foot. Walking feet can vary from model to model within a manufacturer's line. Know what type of shank your machine has...either high, low or slant (this information will be in your manual). If the manufacturer no longer makes the model, you may be able to purchase a generic foot. You'll need to know the type of shank to get a foot that fits properly. Does it come with a channel guide attachment? This guide fits onto the foot and makes quilting parallel lines a breeze. Mark only the first line and let the foot do the rest. There may be a left and a right channel guide. This is a mechanical foot. It wears out with use. I know because I've replaced a foot due to oodles and oodles of ditch and straight line quilting. If the foot and it's feed dogs don't move as the needle clamp screw goes up and down, it is broken. The arm (sometimes it is more like a fork) is the weakest part, so do take care where you store it to extend its useful life. 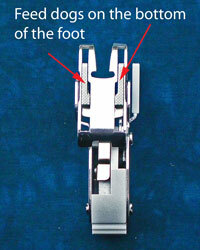 If you're a beginning quilter this quilting foot belongs in your accessory case. If you're a confident quilter, having some experience quilting larger quilts, you may be ready to trade this quilting foot in for a darning foot for all your quilting.